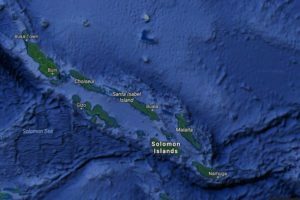 Merely a couple of hours flight from Australia lies the Solomon Islands. Beautiful and remote, thousands of tiny islands still remain uninhabited and in the surrounding waters there is a richness of marine life of spectacular proportions. In this underwater playground you will see many wrecks from WWII battles, some only metres from the shore. The major shipping channel has been named iron bottom sound due to the amount of wreckage resting on the ocean floor. Here there are submarines, planes and ships covered in brilliantly covered corals and teeming with life. There are absolute virgin reefs and amazing walls that drop away from just below the surface to over 600 metres. These walls can run for kilometres. There is every marine creature imaginable here for you to observe and enjoy. The most popular islands to dive from include the islands Gizo, Munda, Tanna, the capital Honiara and the very remote, peaceful island of Uepi. At Honiara you can dive all manner of WWII wreckage in Iron Bottom Sound, or shipwrecks straight off the beach At Gizo, dive such famous sites as Grand Central Station and the wreck of the Toa Maru. Gizo is equally as fascinating above the water. Visit traditional villages, take a walking tour with local story man, or do WWII tours. You can trek the dormant volcano Kolombangara, or take a day trip to skull island. Uepi is for those who really enjoy getting away from it all. There are no wrecks here, just amazing coral reefs, steep walls and crystal clear water. Uepi is the ultimate in tranquility and boasts a relaxed atmosphere. The Solomon Islands were the scene of a number of major naval battles between American and Japanese navies. Follow this link for more information.